We are currently in Michigan at the home of Terry Sheaffer. We've had the week off from trialing so we have been dodging raindrops and getting the dogs geared up to go again. The last trial showed us where we needed improvement and what needed fixing. But most of the dogs just needed a tune up. We will be leaving tomorrow to head down to Harrodsburg, Kentucky to the Shaker Village Trial. The temperature is supposed to hover in the mid sixties but they are expecting rain all weekend and some thunderstorms on Friday. However, I don't think they are planning on the horrible downpour they had last year and I just can't believe it could be any worse than Plumb Lucky! (knock on wood) There are 67 open dogs and 18 nursery. Friday they will run Pro Novice, Ranch and Nursery I. Saturday will be Open I and Nursery II and Sunday will be Open II and the top five combined open scores will go to a double lift late Sunday afternoon. I will once again try to post scores and pictures as soon as the classes are done but if I get bad reception again, I will save all the info and post it on Monday. The second day of open wasn't any dryer but our trial hosts were outstanding. They have one of the most hospitable trials and any thing you need they will give you. We love this trial for that reason. And thank goodness for their big tractor that could pull all trucks and campers out of the mud whenever you were ready to leave. Maid's second day did not go as well as the first. Most of the way around the course she was good and her shed and pen were good but she had a running group of sheep and a hard rain again and it started to wear on her. On the third leg of the drive she buzzed the sheep. She didn't make contact but the judge punished her by only giving her 8 points for her drive. Unfortunately, that took her out of the running for the overall buckle. Roo slashed again at the top and never quite settled down again. He headed the sheep on the crossdrive so Scott retired him. I still don't want to talk about Lad's run. Not sure what's going on there. Hemp ran outstanding, however a miscommunication kept us from placing. He had a good outrun and lift and I didn't even need to blow a whistle on his fetch until after the fetch panels. He made both panels but as he went through the crossdrive panels I blew an away whistle to start him back to me. Scott said the way I blew it, it sounded funny and he knew Hemp would take the wrong flank. I thought he was being stubborn and so I made him circle again - thinking I was training. I didn't realize the dog had tried to be good and I was waisting all those points! Anyway, after that, he had a good shed and pen and got 71 points. Because Scott didn't score very high on the first day with Drift, he knew he was going to have to really lay one down to win the overall buckle donated by Deb and John Cleveland. Drift lifting with the Leeton cemetery in the background! Alasdair MacRae had it just about wrapped up with Star until Scott and Drift went to the post. He knew as he stepped up there he had to get a 95 to win it and that's what they got! It was a beautiful run and Drift couldn't have worked much better. MUD! RAIN! It was a mess. Most of the day was a hard rain, with a short sunny break in the afternoon. We give a big thank you to the worker's at the trial who were wet and covered in mud but never complained or stopped working. Scott's Drift started the open class in a big down pour. 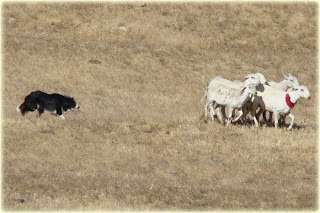 He ran a nice run but had a leader sheep that was looking for some shelter and didn't care if the other sheep came with her. He listened to Scott's instructions and got her around the course in good fashion but she didn't want to go into the pen and lead the others around and around until there was only one point left when she went in. Drift ended up in 15th place. My Hemp ran at the worst part of the morning. Horrible thunder and some lightning (it wasn't striking near us so I did go to the post during it). I can confidently say that Hemp is NOT afraid of thunder. He worked pretty good in his first open trial and was listening to everything I said until... the crossdrive panel when a reoccurring problem cropped up and he headed his sheep and brought them back to me instead of putting them through the panels. 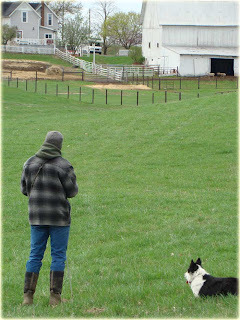 Then the run fell apart and he sliced at the pen and although he had a calm shed he looked at the sheep behind him. He didn't place but got a 67 for a score. I don't want to talk about Laddie's run. Let's just say he wasn't listening. Roo had a good run except he crashed the sheep at the top. It was very disappointing since we thought he was over that old habit but it came back again at this trial. However, the rest of the run was good enough that he placed 7th in the trial and with 60 something dogs in the trial this was nice. but she listened so well that they made all their panels, got their shed and pen and ended up winning the first day! Ok first an apology. I'm missing the placings for Saturday and Sunday trials. I know what our dogs did but I'm embarrassed to say I don't have the top 10 scores yet. I will get them this week from the hard working Deb Cleveland who is the secretary for this trial. She promises to email them to me and then I will post them here. My excuse is that if you could see the rain and mud here you would understand and most of the scores are not being left up after the classes because of the mess. Anyway, I'm going to stick with that story. I figured I'd get the information posted on how our dogs did now, and then get the rest of the placings up this week. As for the second nursery, Scott ran Tuque, Sleat and River. River didn't really get going on his run. Scott was setting him up for his outrun and didn't notice that someone was walking on the course. When he sent him River had focused on the person and never found his sheep. Sleat had a good outrun. Her drive didn't go so well though and she missed all her panels. Tuque was the star in this class. She had a set of sheep that were very difficult. They gave the set out person all kinds of trouble and just tore down the field. Tuque tried to hold them back and even tried to head them but stopped every time Scott asked her to so she never got off line. She made her panels and her pen - Scott had to keep her way off the pen because the sheep were so touchy but they went in. When all was said and done she was 3rd in the class and got her first leg to qualify for the nursery nationals! The third nurseries were held on Saturday and Scott ran Jess and Whiskey again. 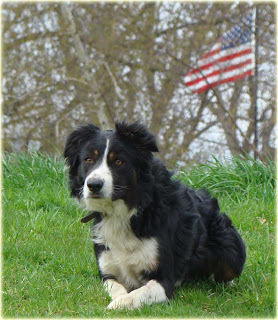 Whiskey improved alot but when Scott noticed he wasn't going to get a leg he just used the run for a training round. Young Jess, unfortunately had a flock of Guinea fowl on the course for her run and did a nice outrun on them. Of course they weren't the right kind of stock so Scott called her off when she didn't want to leave them to look for the sheep. The final nursery trial was on Sunday and went the best of all the days for us. River, Sleat and Tuque ran this time. River got out to his sheep this time but was uncertain about the set out person and he crossed over. He was strong around the course which was good to see but he didn't get a very high score. Sleat did much better and ran a pretty good course. She placed second and got her first leg towards the Nursery Nationals! Tuque really stood out at this trial. With another difficult set of sheep she controlled them well and placed first in the class! She is now qualified for the Nursery Nationals. 2. Alasdair MacRae and ? OK, I will do my best on updates but days are past now and I can't remember as many details. Friday was another beautiful day and the dogs performances perked up. Donnie and Tuque ran in Open Ranch. Don had some trouble on his first outrun but was clean on his second one. Tuque was clean on both of her outruns and has clearly mastered that part of the course. Don ended up in third place in his second go with a smooth run. Interestingly enough, first place went to his older brother Rex handled by Alasdair MacRae. Hey everyone! I'm not forgetting my duties but I am having only on and off reception and can't get a full blog done. I will update completely on monday. Quick up date - Maid won open yesterday, Roo was 7th. Donnie was 3rd in open ranch and Tuque was 3rd in Nursery. Horrible rainy weather. MUD! Leeton, Mo. The weather has so far been with us as it is a beautiful day with a light wind - going in the right direction. Today's trial didn't start until 4PM and was only a single nursery class. The sheep are Katahdins and it is a rolling green grass field. An added distraction for the dogs was the addition of some curious guinea fowl who were prowling the trial field. Unfortunately, they did confuse one dog who left on his outrun only to come in behind the birds and try to bring them towards their handler. 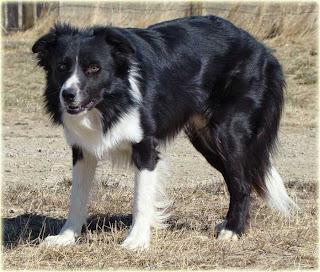 Scott is splitting up his nursery dogs so today he only ran Jess and Whiskey. (I know, I've never mentioned Whiskey - update in a minute) Jess was keen to start her outrun but was a little confused by the hills and came in too early on her outrun. She did stop every time Scott asked and even gave ground but just couldn't understand that if she'd look a little further up she'd see them. She crossed over and picked up the sheep from the other side. 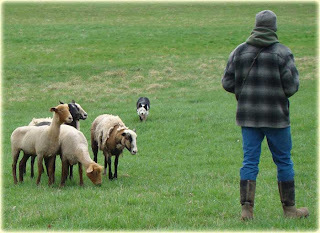 The sheep lifted to our left and stayed on the left side of the fetch line, missing the panels (a common problem with the young dogs). 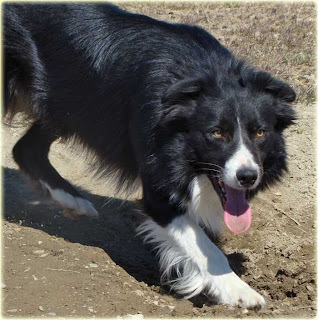 Whiskey - (belongs to us - out of Dal Kratzer's Tib, mother of National Champion Star and his Shep) was also uncertain about the hills on the outrun. 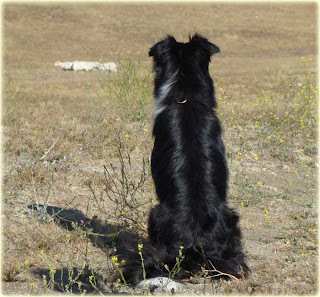 However, Whisk did look up enough to see the sheep and managed to pick up his sheep on the same side he was sent. Again there was a fetch to the left of the line and missed panels. His turn around the post was good and his line to the first panel was on but there was some wobbling in front of the panel. Finally, he got them through and then had a nice line on the crossdrive until he hesitated right in front of the crossdrive. All was well though and he did make the panels but unfortunately, the time ran out just as Scott was closing the pen door so there were no points for that. Alasdair MacRae dominated the day with 3 dogs in the top 5. Dare I say, "On the Road again" or is that too cheezy? Well we are anyway. It's a windy day in Montana but we are making progress. We had our first potty break and everything went as planned. It might not seem like a big deal but with this many dogs you have to plan everything. We also have the added complication of 4 pups but they all went along with the program and we managed to get everything done in less than an hour. We are using a chain tie out for many of the dogs and the veterans get a quick free run. All four pups ate, drank and did the unmentionable in their x-pen so we will be good to drive on for many more hours. We barely had time to enjoy the beautiful scenery before we packed up and headed on our way.